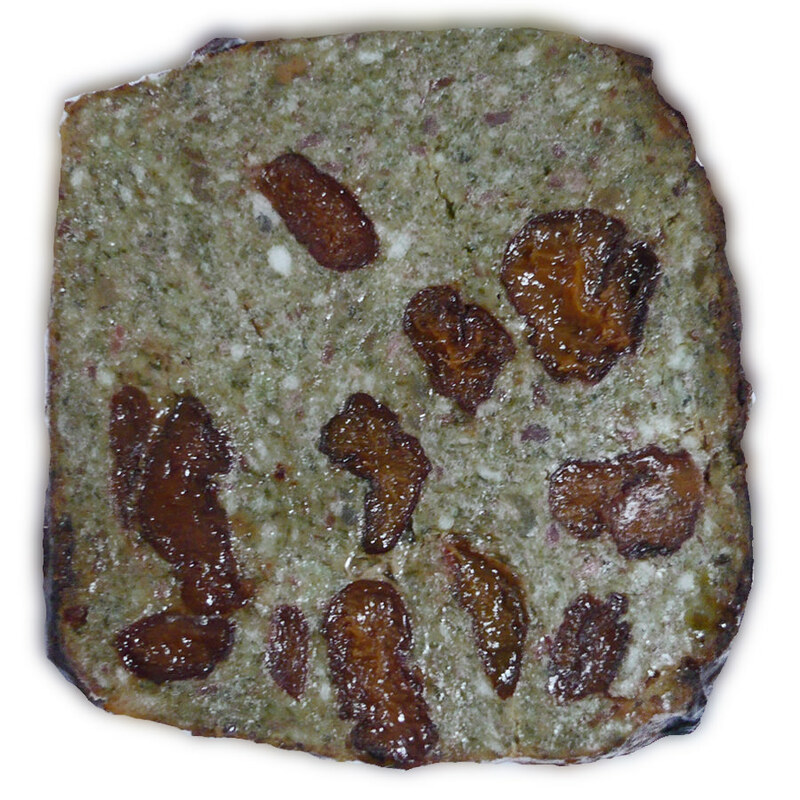 Pounti, a traditional dish baked in a rectangular bread tin or earthenware terrine, can still be found on sale today in most Auvergnat charcuteries. Its ingredients are as outlandish as its name is melodious (it derives from an Occitan word, pontar, meaning ‘to chop coarsely’). They include a typically mediaeval combination of meat (in some cases), eggs, parsley, Swiss chard tops and prunes. It can also be a dish that is pretty inedible in the hands of a ham-fisted cook: one pounti I ordered at an Aurillac restaurant was so gorged with fat that when I put my fork into it and pressed the knife down to cut it a small pool of molten lard formed on the surface (reminding me, in a horrible flash, of the spam fritters I had to force down at school). In less weight-conscious times, when pork fat was an essential source of energy for hard-working, pre-mechanised farmers, fatty pountis were the rule, designed to compensate for the energy expended by manual labour. But when expertly made, pounti is very different – a light, aromatic and refreshingly clean-flavoured dish with a crisp brown crust and a greenish-beige centre dotted with pleasantly mushy prunes. It is also good cold, and often used to be included in the baskets of food and drink that were taken out into the fields for hungry harvesters and haymakers when crops had to be scythed and gathered up with pitchforks. As is often the case with traditional recipes, there is a wide variety in the possible choice of ingredients. Some claim that pounti should ideally be a vehicle for meat leftovers – and a very good one it is. Others argue that pounti should contain no meat. It certainly true to say that in the 20th century and earlier, when Auvergnats could not afford to eat much meat, the meatless pounti was the rule. Meatless, of course, does not necessarily mean vegetarian, as pork fat is used in many recipes that call for no meat. The following recipe, like the excellent one described above, includes a little meat. It was given to me by Yvonne Figeac, who with her husband Jules used to run a ferme auberge (now sadly defunct) in the hamlet of Cantuel (Cantal). The idea behind fermes auberges – ‘on the farm’ restaurants introduced in 1978, which enjoyed a more favourable tax regime than traditional restaurants on condition that 80% of what they put on the menu was produced on the farm – was to boost rural tourism. The Figeacs’ ferme auberge was by far the best I ever came across. Guests would eat in a small log cabin that would not have been out of place in a Western. They sat at separate tables, but the menu on a given day was the same for everyone. It might include any – and sometimes all – of the following: excellent soup, made with the best stock and vegetables, a platter of charcuterie (pâté, saucisson sec and home-cured ham), pounti, a featherlight chou farci, a wonderfully creamy aligot (mashed potato combined with unmatured Cantal cheese), roast chicken or duck (two pieces per person), salad, a well-chosen selection of cheeses and a prune tart which, despite the gargantuan feast that preceded it, would slip down a treat. Boil the prunes in water for 15 minutes, if very dry (the moister kind can simply be infused in boiling water or tea). Break the eggs into a bowl and add the flour, cornflour and cream. Chop the Swiss chard tops, parsley, onion and salt pork or bacon very finely and add to the bowl. Add a good pinch of salt and plenty of pepper. Mix vigorously. Gently incorporate the prunes. Pour the mixture into a 1.2-litre (2-pint) rectangular bread tin. Bake in a fairly hot oven (200°C/400°F/Gas mark 6) for 60 minutes, or until the top is well browned. Remove from oven and allow to cool for 5 minutes before serving. An even more outlandish cousin of pounti is picaucèl, which derives from picar, another Occitan word meaning ‘to chop coarsely’. Made in the same way as pounti, its ingredients include buckwheat flour, ham (sometimes), Swiss chard tops, parsley, eggs, prunes and pears.